UPDATED: Norway’s krone has been through another period of extreme weakness during the past week, but it gained strength on Thursday. The boost came after the country’s central bank hinted that it may raise interest rates sooner than expected, and then that rates may rise faster. Norges Bank’s Executive Board decided to once again keep its key policy rate unchanged at 0.50 percent, at least for now. It noted, however, that “a weaker krone than expected … may lead to a faster rise in inflation than forecast earlier.” Wage growth “is also likely to edge up,” the bank predicted, as spare capacity in the Norwegian economy is absorbed. “On the whole,” intoned the bank board, “changes in the outlook and the balance of risks imply a somewhat earlier increase in the key policy rate than projected” in the board’s report issued in September. That can boost the value of the krone, and traders seemed to respond immediately. 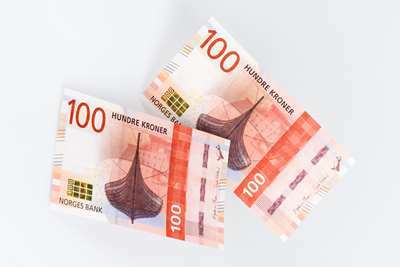 Norway’s krone, which had been trading at nearly NOK 8.40 to the US dollar earlier this week quickly gained strength. Within just a few minutes of the bank’s 10am release of its key policy rate decision, it cost just NOK 8.21 to buy one US dollar. It cost NOK 11 85 to buy one British pound just before the interest rate news and NOK 11.05 just after. The krone also strengthened against the euro. That’s because analysts now see greater chances that Norway’s central bank will start raising interest rates next year and keep raising them at a faster clip. They’ll remain historically low, with the bank’s estimate indicating a key policy rate of 1.5 percent around January 2021. But that’s higher than expected last spring. A consensus of Norwegian economists had predicted to newspaper Dagens Næringsliv (DN) on Wednesday that the Norwegian bank board would keep interest rates unchanged this week, as it did. Concerns over the health of Norway’s once-booming housing market are likely to keep them relatively low, the economists predicted, and contribute to keeping the krone relatively weak as well. Despite Thursday’s boost, Norway’s krone remains much weaker than it was a few years ago, when it only cost NOK 6 or even less to buy a US dollar. Now housing prices are falling as are sales of new housing coming on line. Norwegians are also saddled with record-high debt burdens, not least as a holdover from the boom years and skyrocketing housing prices through 2016. Those factors were expected to keep the bank board from raising rates right now. A sudden rise in mortgage rates, for example, could further disrupt home sales and make it harder for lenders to meet debt obligations. The board noted that “the upturn in the Norwegian economy is continuing” as it recovers from the shock of the oil price dive in 2014, but the board also cited a “continued need for an expansionary monetary policy” in deciding to keep Norway’s key policy unchanged. The board also noted that interest rates abroad are low as well, even though the US Federal Reserve was raising rates itself. The board had stated in April that its key policy rate is “forecast to remain at 0.5 percent” until next autumn (2018), at which point it may be subject to “a gradual increase.” Now there are signs that “gradual increase” may pick up some speed, and lenders have been warned.